A conversation that started in 2011 reached a major milestone on May 28 with the installation of our church bells. When we were asked to ring our bells on the 10-year anniversary of the 9/11 attacks many were surprised to learn that St. Mark’s didn’t have bells. The topic gained interest and funding came next. 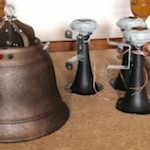 Last year’s yard sale began the effort to raise enough money to make bells a reality. The goal was met quickly and Jim Russell, for the vestry, began the business of seeing the project through. Many phone calls and lots of research lead Jim to CompuChime, located in Ft. Wayne, Indiana. Their product received positive reviews and they had a significant number of installations. Checking references and setting up a site visit was next. 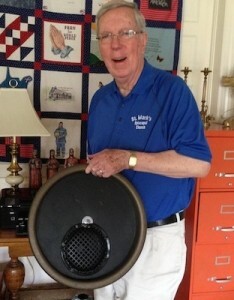 Jim called 5 references and visited a church to see the bell system in action. It was further confirmed that the CompuChime carillon would be a good fit for us. 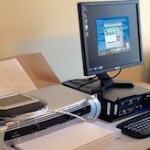 An offsite computer controls the system and takes quite a bit of study to operate. The system is set-up to chime on the hour from 8:00 a.m. to 8:00 p.m.
Each hour the bells play the Westminster Chime and then gong the hour. At 8:00 p.m. each evening Abide With Me plays and then the system goes to sleep until the next morning. Saying Thank you to Jim seems inadequate given the countless hours he has devoted to this effort. The vestry and rector greatly appreciate his efforts, as do we all. Thank you Jim and may God Bless you now and always.